Particle & Astro Physics and other assorted science geekery. Space Debris – Some creative thinking and “out there” solutions. Quite a few people talk about the dangers of space debris. It trends on twitter in cycles and is a hot topic in the space world. So, given my the exposure to the topic (mainly by the peeps on twitter) I did a little reading and then let my overactive imagination loose on the problem, well …. a section of the problem anyway. Lets first set the scene. Space debris, or space junk, is the ever-increasing collection of used rocket stages, defunct satellites, and collision fragments that circle the planet. The problem is mainly found in low earth orbit (LEO) but not exclusively. Wow, there’s a lot of crap up there !!! So why is it such a problem?? Well…. 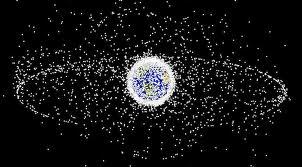 with the amount of junk that’s now up there the low earth orbit is becoming a very packed place and if we don’t do something about it soon, spaceflight and in fact any launches, even to put satellites in orbit, will prove very difficult. With so many objects in the same or overlapping orbits, the chance of collisions is on the increase. The main problem with this is that an impact between two pieces of debris, generates even more debris and can even create clouds of debris. This resultant net increase in the amount of debris raises the probability for further impacts, with propagation runaway becoming a real possibility (the Kesseler Syndrome). There have been numerous suggestions of how to remove the larger pieces (spent rocket stages and old satellites etc.) most of which relay on having another satellite intercept the junk and attach either an active thrust device (ion engine or conventional thruster) or a passive inductive drag device such as a solar sail. Other methods include laser ablation to induce momentum and setting off small thermonuclear devices to vaporise unwanted debris. These methods are the most likely ones to be used, barring the thermonuclear option (probably!). Below are some of the thoughts I personally had whilst considering the issue over a couple of days. Some of them are only semi-serious and the others may even verge on the ridiculous. But, thinking about it, being creative, highlighting the issue and talking about it has to be a good thing …… right ??? And before anyone shoots me down, there may well be overlap with a number of other much better ideas already out there. These are just a few of my own (possibly ill-informed) ramblings. I was looking at a spider web the other day whilst daydreaming (as you do!). What an elegant design! Super strong thread and highly sticky. What a good way to catch stuff, but could this be translated into a much much larger scale to trap bits of junk in space? I don’t know….. maybe ?? Using monofilament threads made into a net and coated in glue, this could be spread out from an orbital delivery container, using very small thrusters to “pull” the corners apart. The questions and problems that arise from this are pretty obvious though. The net would need to be massive and collision fragment clouds tend to be spread over a very wide area. Based on the above, does this render the glue net defunct ?? Hmmmmm…… not necessarily. Lets say that you made it target specific with regards to debris size and used it only in the area of a cloud that has the highest spacial density of fragments. Maybe some sort of carbon fibre thread could be used. Would the glue be strong enough to hold that fragment even after such a momentary contact? Would the fibres that the net was made of be strong enough not to just be shredded by the impact? The trick would be not necessarily to have the net taut but very very baggy to give the maximum amount of absorption of momentum. Should even a few of the fragments be caught up, the net could then be “encouraged” into a degrading orbit using the thrusters that erected it in the first place. The catchers mitt idea is really just a development of the net, but the material used would be a solid sheet and would need momentum absorbing properties much like a Whipple shield. Whether this would better be a stuffed or spaced variety would be best decided by experimental design and testing. The idea would be to manoeuvre this large shield around inside the debit field orbit to “catch” whatever fragmentary debris were possible until the “mitt” were so degraded by impacts that it lost any further usefulness and itself became a risk of possible fragmentation from impacts. It could then be manoeuvred into a graveyard orbit or urged into a more rapidly decaying orbit. DARPA currently have a program codenamed “catcher’s mitt”, looking at tethers and solar sails for altering the orbits of large items of junk. Interestingly, the previously mentioned solar sails need to be ‘erected’ or expended when in orbit. The net and mitt ideas also require an expanding mechanism technology to deploy them. Although I have mentioned the possibility of using small thrusters for the net idea, another way might be considered. Were the backs of all these sheets and surfaces covered in a web of tiny hollow pipes, a liquid (or maybe a gas) could be pumped through them causing them to unfurl much like the wings of an emerging dragonfly. I’m sure I can’t be the first person to think of this. The idea behind this last strategy came about after remembering a childhood holiday spent on a pebble beach in the south of England. I can clearly remember throwing fist sized beach cobbles at a large rounded car size lump of rock a good distance away in the sea and then being amazed at how the rocks appeared to bounce or ricochet off the curved surface almost with an apparent complete preservation of momentum. That was just the seed thought as its really the ricochet bit that is of interest. Let say that it were feasible to get a relatively strong surface into space (we’ll come back to some ideas in a bit) that could be manoeuvred into the path of the debris – would this be capable of deflecting smaller items back towards the atmosphere to harmlessly burn up on re-entry??? Similarly to the catchers mitt idea, this “debrisflector” would have to be actively manoeuvred around inside an oncoming debris field to intercept the maximum number of objects. This also assumes that the surface could be made hard enough and correctly angled. One other thought for the debrisflector would be to induce an ultrasonic vibration in the surface. This might then mitigate damage done to the surface by impacts (ricochets) extending the lifespan and usability of the unit. So how could the reflecting surface be made strong enough to resist impacts and reflect properly, yet lightweight enough to be delivered to orbit in the first place?? One idea would be to use a composite sheet made of some form of metallic surface with a doped and strengthened aerogel backing. It could potentially be delivered in sections and assembled in orbit although this could potentially introduce weak spots at the joins. The other main issue with reflection is the possibility that the object may not “ricochet” in whole pieces but may create an even worse problem in further clouds of collision spall. The only mitigating factor is that this cloud would then be directed towards the atmosphere for a relatively rapid re-entry. Why I always take my son outside to watch the ISS fly over. Rosetta and Philae – The afterglow of “that day”. Comets Comets Comets – Will Rosetta & Philae recapture the public’s imagination?